BIGGER, STRONGER, BETTER this is the only title it came up to my mind to try describe Primavera Sound Festival this year (2014)! The park El Forum throughout the years have become in a parallel universe of music and it is the same place every year but it mutates and transformed with really good taste and accuracy. This year Primavera exceeded the level of attendance again with an overwhelming program that started early with free concerts around the city, in bars, clubs, parks, etc…given you the opportunity to local musical proposals to shine alongside established foreign musicians. 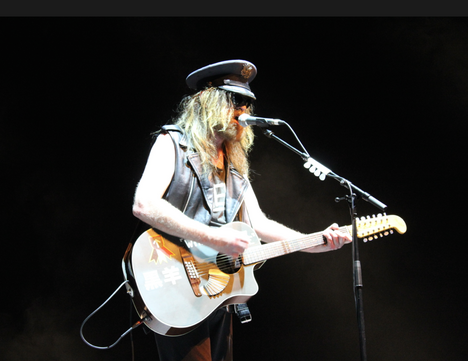 It was GREAT to start so early at the Auditori with the ex-Teardrop Explodes, Julian Cope. Armed only with a guitar in the middle of this big stage, this charismatic poet delivered a pure and raw demonstration of power performing songs from his new album “Revolutionary Suicide”. Early on Thursday the Heineken stage with Real State performing songs from their new album “Atlas” the band played early but the people was already there waiting for their delicate pop-rock. 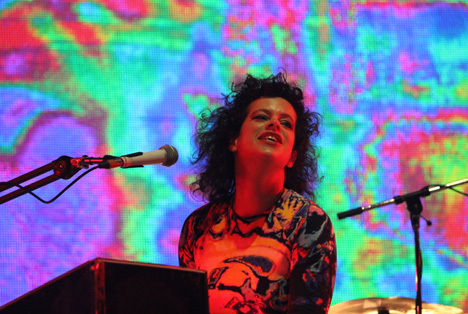 The band sound was clean and fresh, perfect for the sunny day and the start of Primavera. 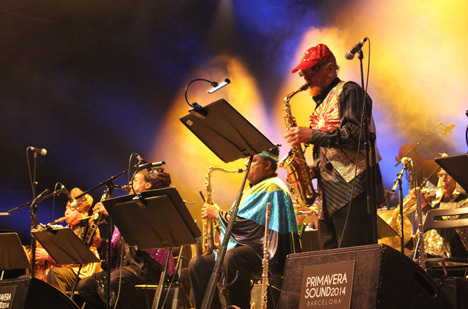 Followed one of the most remarkable names in this year line-up, The Sun Ra Arkestra making magic at the Auditorium, the band lead by 90-years old legend Marshall Allen was flamboyant, colorful, cosmic and delightful. 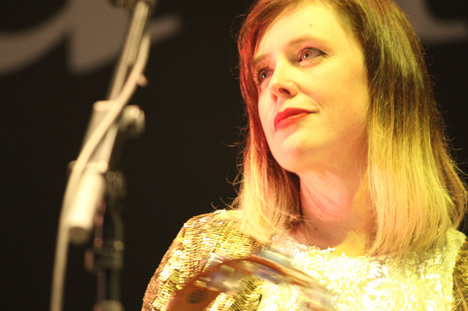 Playing with the audience, dancing on stage and delivering their Avant-Jazz from Saturn. The Arkestra performance was special and magical and the people responded dancing and ended up with a standing ovations. Brilliant musicians that keep alive the memory of the great Sun Ra! 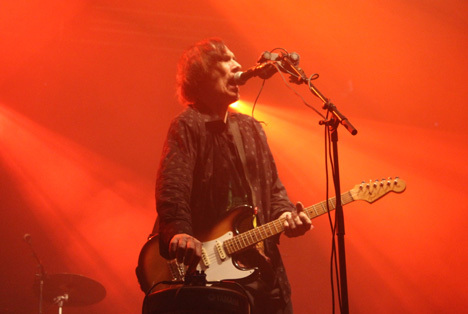 The Vice stage heated up for Helios Creed in front of Chrome, the band presented their dark proto-punk creating isolated atmospheres and adding a bit of darkness in a brilliant performance.. Right next at the Pitchfork stage it was difficult to move till the front with so many people concentrated to see the band lead by Lauren Mayberry Chvrches. Even the band was surprised and thankful for choosing them instead of one of the big headlines Queens of The Stone Age. 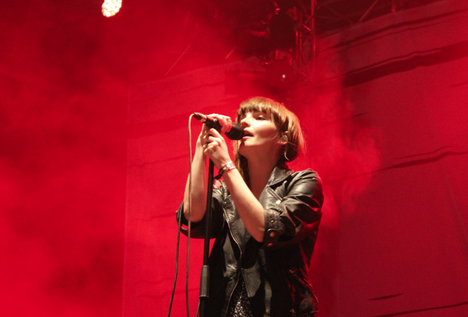 But the audience was well corresponded with the band Live show with their synth pop catchy hits. and for closing the magnificent first day of Primavera the Sony stage received the BIG party that is the performance by Arcade Fire, this band have changed a lot and had became a big mainstream band, but this also matches with a performance at 00.30am in a big stage like Sony. 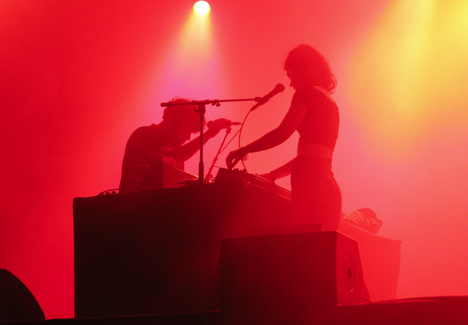 Lots of colors and neon, with a game of lights and all the ingredients that make it a party… the audience seems to remember and appreciate more their past albums and its a bit cold with their new “Reflektor”. But overall, it was crowded and the people seems to have enjoyed the show… which is the matter. Friday started with people looking at the sky because the weather was announcing rain during the Festival. At 6.30 pm we started the journey at the Heineken stage with John Grant, and in our way to the stage, loud thunders began to announce the rain, we were able to hear his first song “Vietnam” and it was at the second song when it began to rain and we run out of there without time to enjoy the concert, but many people stayed and enjoyed the concert till the end under the rain.. The rain continued for about 1 hour and instead of spoil the party, the people enjoyed dancing in the rain and wearing their colorful gumboots, rain walked away leaving in the sky a double rainbow, that was one of the highlight pictures of the Festival, every social media talking about The Festival at that time had a picture of the rainbow. Clear sky, happy people and back to the Heineken stage for one of the day sensations with the young talented sister-trio/band HAIM, the front row was full of young girls with holding banners and wearing the band T-shirt. The sisters took the stage like a cyclone delivering a enthusiastic show performing their first album ‘Days Are Gone”. It was surprising to see this young girls with such a attitude and talent, very sure of themselves and having fun with the audience and really rocking. The Sony Stage was packed and ready for the shoegaze and ethereal sound from the cult band lead by Neil Halstead and Rachel Goswell, SLOWDIVE and their presentation was fantastic. The concert was balanced and rising from start to end with instrumental passages leaving space for great vocal accent. Wonderful performance and people appreciated this cult band reunion. 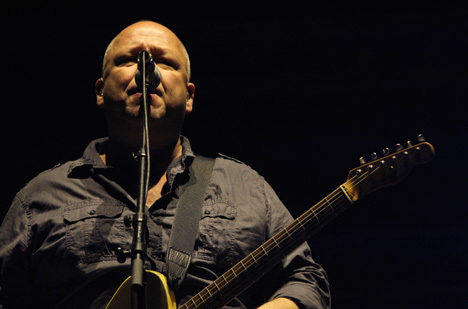 Friday continued big with the presentation of Pixies at the Heineken stage, the band that performed some years ago at the Festival (including Kim Deal) demonstrated once again that the people have not forgotten their famous hits. 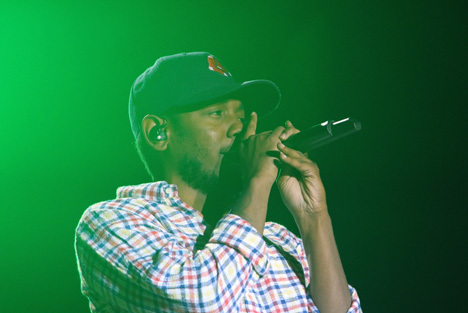 It wasn’t not so different from their early presentations and the songs and continue to be chanted by the audience. 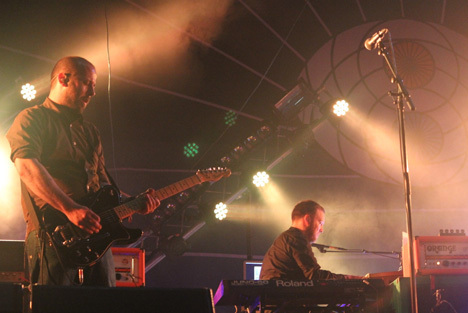 The Pixies are aging but their songs still remain as a pretty good moment of our lives. 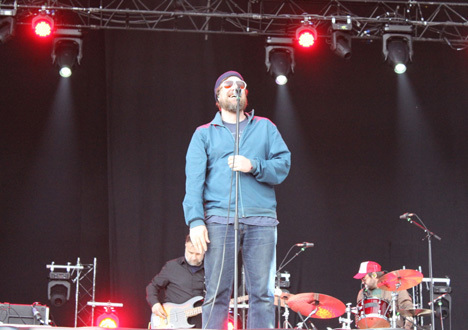 And finally, at the ATP stage, one of the most remarkable performances of this edition came with SLINT. The band came out to the big stage where everyone was waiting for them in a quiet silence that remained during their performance, it was incredible to see the people so quiet and concentrated it seemed more like a church or an auditorium… but it was a open stage at midnight. The band played so sharp with strong dosis of intensity and perfection like a clock. They took their time between songs and it seemed that people were holding their breath to get blown away by their powerful sound. 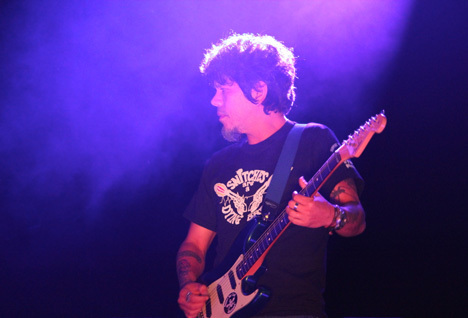 Incredible, Slint is a cult band formed by amazing musicians, PERFECT!. Saturday, was a day of running from stage to stage because many concerts overlapped, but we arrived really early to have a good seat for one of the highlights of the day which was Kronos Quartet. And we were not the only ones that get early to the Forum Auditorium, the concert was full. 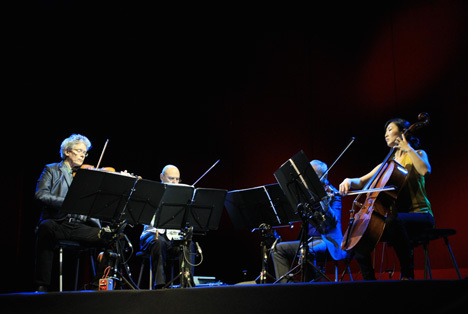 The Quartet performed songs composed by Bryce Dessner, Omar Souleyman and Nicole Lizée among others, mixing the classical instrumentation with electronic devices in a remarkable concert that will last for so long in our memory. 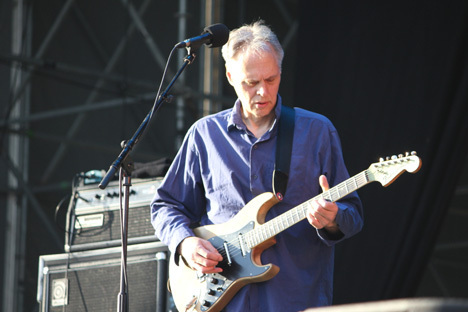 It was difficult to keep the level after the Kronos Quartet, so there was nothing better than revive a classic like “Marquee Moon” from the cult band Television, one of the big and awaited performances of the day, started slow and with Tom Verlaine never seemed to get comfortable trying to bring the magic of this enormous Album from 1977. 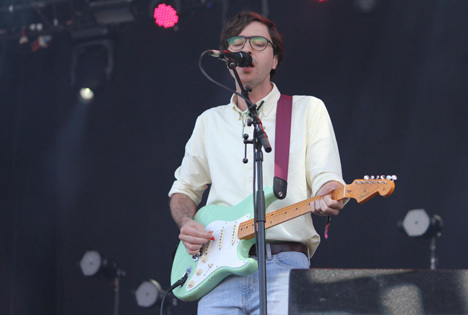 Maybe it was too early and the expectations BIG, but the true is that Television are not one of this bands that get together again and it seems that time has not passed and everyone noticed after watching other band reunions like Slint, Slowdive, Pixies, etc… that delighted us at the same festival. 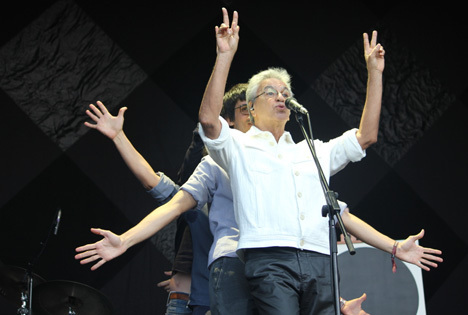 But in Primavera you don´t have time to waste because at the Ray Ban stage another legend was ready to start and one of the most unique performances were about to happen, with the presence of the Brazilian figure Caetano Veloso. I had listened so so many songs in my youth and through the years in movies, Theater and TV that it was really exciting to see Caetano performing Live, and it was beautiful, the Ray Ban stage is the scenario that has some bleachers around and it was packed to listen this legend singing his sweet songs in With 70 years old the most prominent figure of “Tropicalismo” gave us a memorable concert. Saturday was also a day with some Hip-hop highlights, starting at the Pitchfork stage with Earl Sweatshirt member of the collective Odd Future performing songs from his brilliant album “Doris”. 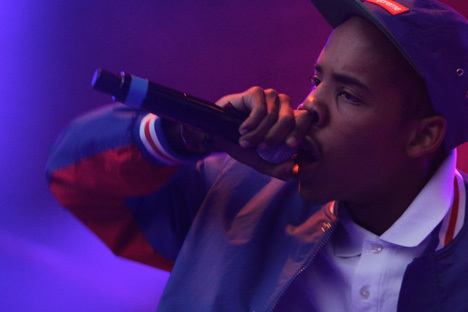 Earl have great rimes but also a lot of charisma, for young man in the Hip-hop world, his show was basic and simple with only supported by a Dj but it was enough to a great concert. Really intense day after all this great performances, but still we have maybe the Big headlines of the Festival. Yes, Nine Inch Nails were ready to conquest the Sony stage like an armored battleship. Waiting for them was incredible., NIN show is almost perfect with their sound, lights and power. 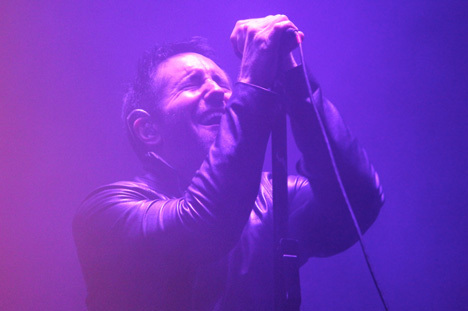 Trent Reznor and his band defeated the expectations of his fans. Probably the best sound of the whole Festival. To finish up this amazing journey at the Forum for this edition of Primavera, the thick and heavy sound of Mogwai, from inside the earth to heaven with their powerful wall of sonic sound, epic, like winning a world cup! Guitars like knives creating sound that got into our veins. Perfect ending for this EPIC days of Festival. After 3 crazy days of Festival, Sunday is that kind of day that you are trying to get back to a normal life, but as I said at the start of this article, Primavera is big, better and stronger and would not let you wait till next year just like that. So Sunday still has an incredible concert program, that includes one of my personal highlights of this edition Grouper, the project of Liz Harris. This concert was in a special place, a small theater in the center called Barts. And Grouper show was marvelous, exquisite and delightful, Liz Harris created a new landscape between sorrow and melancholia, dramatic but subtle and incredible beautiful. 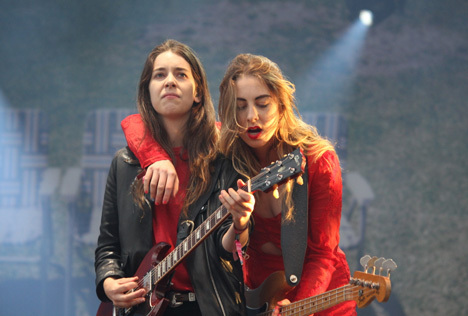 I´m happy that the Festival decided to make this concert in this place and not in an open air big stage, because it was intimate and deep, and the BEST way to finish this incredible edition of 2014 Primavera Sound.